Welcome to the wiki of the Hackuarium association! BIG NEWS: Hackuarium is moving! 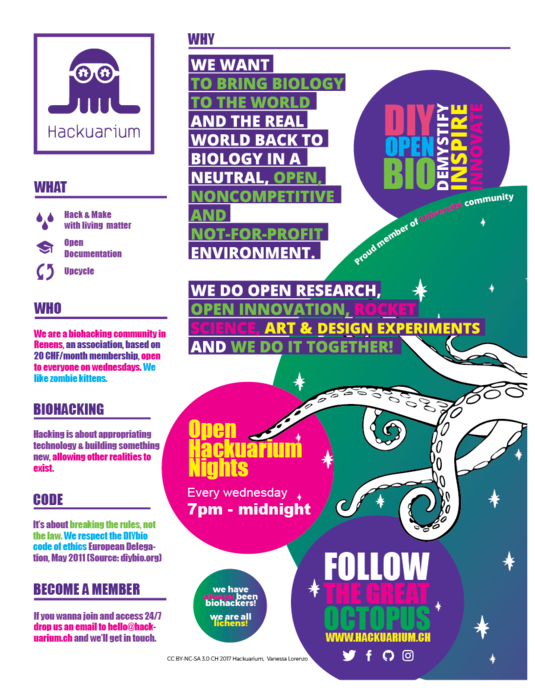 Hackuarium is currently searching for a new home after being generously hosted for four years in infrastructures provided by UniverCité, an unconventional innovation hub that opened in May 2014 in the "Ateliers" in Renens (formerly IRL building). Our equipment is mostly upcycled material from institutions and industries from western Switzerland. We have documented our working environment as it has evolved. Currently, our big hoods and other equipment are in storage, ready to be moved into our new lab space! Between December 2015 and January 2017, UniverCité regrouped our laboratory, a workshop and coworking space. The floor where we originally moved in 2014 required some refurbishing and was under construction work from January until June 2017, and we temporarily relocated on the first floor of the same building. Since July 2017, we have been back on the second floor of what is now called the "Ateliers de Renens" Chemin du Closel 5, 1020 Renens. The original plan in the renovated space was to have a biohackerspace on one side, with a 'pro' lab space on the other, and a shared biosafety level 1 laboratory in between. The community lab idea for UC, however, has now been given over to primarily startup and co-working hosting. When Hackuarium was asked to pay rent as if it were already a startup with a successful business plan, the members decided during an extraordinary general assembly meeting (on 12 September 2018), that we would have to look for a new place to set-up our biohacker space and P1 lab, with enough room to allow further growth and exciting collaborations. A cooperative with another association (Octanis) and a few other startups has come together to look for a new place to call home and provide space for everyone's projects and work. If you have ideas, please do pass them on to any board member! We very much welcome your help and input! The Agenda of the next meeting, our annual General Assembly meeting, can be found here. We have begun the move into our new lab space, in the context of a new cooperative in Ecublens. The big equipment gets installed on 1fev. 2019.03.16 Saturday, Palais de Rumine, Lausanne. 'Ramène ta Science' - Living Instruments and oFoldscope workshops.